My Messy Manger: What is Ghee? That was my question the first time I saw it listed as a recipe ingredient. Fortunately, there is a blog I love called The Nourishing Gourmet, and she not only helped me understand what ghee is, but she also helped me make some for myself. Kimi explains that ghee is "basically butter that has been melted, the moisture evaporated, and the milk solids browned in the fat and strained out. This leaves pure butter fat or oil. It is the pure 'good stuff' in butter." Look at that beautiful, pure, ghee goodness. Okay, but why would you want to take the trouble to cook the milk solids out of butter? Well, if you're not allergic to or intolerant of dairy, and you don't know anyone who is, then there is really no reason to. You can stop reading now. But if you or someone you love can't have milk, then this is going to forever change the way you cook. You can use ghee exactly like you would use butter, because... well... it IS butter! Kimi also points out that it has a much higher burning point than butter, so it is great for very high heat cooking. Ghee is super simple to make, and Kimi gives great, simple, step-by-step instructions right here. I have made it twice now from her instructions and it has turned out great both times. One thing that she doesn't mention: possibly because it is winter and very cold in my house, my ghee had a tendency to very quickly cool off and get too thick to go through my coffee filter. I found that I could put just a little bit in the filter at a time and leave the rest in the pot with the burner still on low. That kept the rest of it warm enough to filter easily. I also wanted to add that each time I made ghee, I used four 500g blocks of butter (which are just a little bit bigger than an American stick of butter) and it made almost exactly 1 liter of ghee, which is perfect because that's what size my jars are. That sounds like a lot of ghee, but I go through it fast! 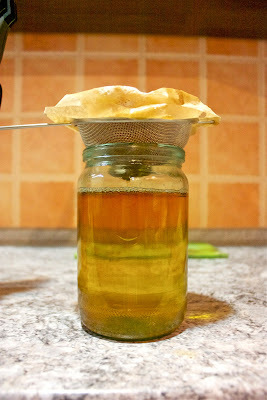 So now that you know about ghee, go check out Kimi's instructions and get to making your first batch! I don't mean to rain on the parade but ghee is not considered a "safe" food for any dairy allergic person. The clarity of the end product is no indication as the whether or not any amount of the proteins has been left behind.